Paint the head flesh and add blush for cheeks and dot eyes with black. Splatter gold paint on heart. 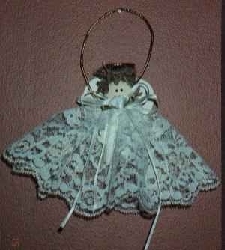 Gather the top edge of 12" of lace and tie around neck of little people. Glue in place at back. Glue a little birds nest to top of head for hair. Form the gold wire into a halo and extra loop for hanging and glue onto center of heart. Glue heart onto back of body to form wings with halo placed over her head. Form 2 bows with the 1/4" ribbon and glue onto neckline area, glue on fabric rosette. We hope you'll enjoy browsing our online catalogue of hand painted wood crafts and country collectibles. While you're there be sure to enter our monthly draw for a Country Candle Holder and please feel free to pick up a free pattern or two. Our customers are important to us and we strive to make shopping with Heart 'N Home an enjoyable and satisfying experience. We have several ordering and payment options available.